This conversion kit joins the popular AX15 and NV3550 overdrive transmissions to the classic, standard shift Ford bellhousings. 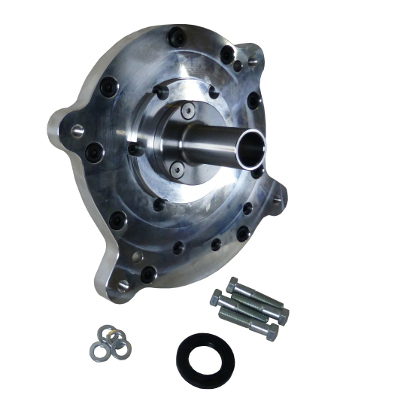 This affordable and straightforward method allows the installer to retain the bellhousing they already own, and in many cases, the existing clutch and its release system. It’s implementation is simple and extremely effective. The adapter is precision designed, and expertly CNC machined from 6061 T6 aluminum. Its thick cross-section provides ample thread engagement and high structural integrity. 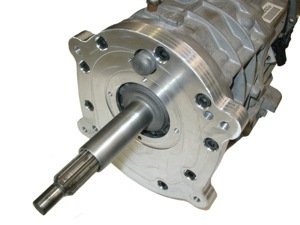 Precision indexing is achieved through locating dowels to the transmission and bearing retainer to the bellhousing. Included is the adapter, bearing retainer (which serves as a centering index for the Ford bellhousing and clutch release bearing sleeve) and required hardware. This adapter assembly is compatible with most Ford bellhousings using the standard Ford “butterfly pattern”. Numerous combinations were used over the years by Ford and the aftermarket. If using a mechanical linkage most anything that can be fabricated to fit will work so long as it retains the correct bolt pattern. Our preferred bellhousing is shown here and detailed on this page. 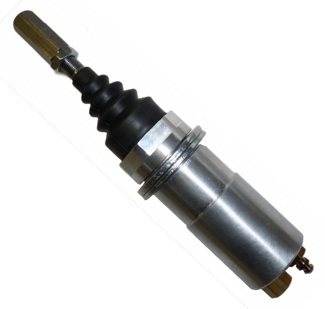 The main reason is the ease of installing a hydraulic clutch slave assembly. This conversion is compatible with CJ7 and longer Jeeps. CJ5 Jeeps do not have a long enough wheelbase for these longer, five-speed transmissions. These are strong transmissions, and full Size Jeeps such as Wagoneers, J-Trucks, etc. are conversion candidates for them unless used for more aggressive driving or heavy work situations. The Ford 289, 302, 5.0L, 351 & 5.8L (small block Ford) Windsor engine family are all compatible with this conversion. 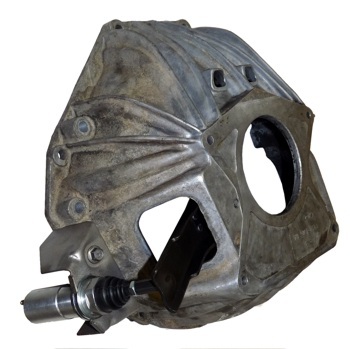 The use of a Ford "butterfly" bellhousing is required. There are some versions of Ford engines that fall outside this parameter and you’ll want to verify that you indeed have a matching combination. Of note are the very early Mustang engines and other of similar block pattern which used a different rear pattern and are not compatible without special adapter scattershield bells. 289, 302, 351, 5.0L and 5.7L Ford Windsor engines all make for great Jeep power. With some creativity, most of the Ford engines that will fit in a Jeep can be made to work with the FMAX15. There are bellhousings available for the Modular series engines including the 4.6/5.0 Coyote/5.4 that even extends into the diesels. At this point we don’t offer full support for all of these combinations but the adapter is very universal. The factory flywheels on the above engines are acceptable. Ensure that the flywheel and clutch match your engine combination. Discs can usually be substituted within standard pressure plates to match the required 10 spline 1-1/8” used by the Jeep AX15/3550. The factory pressure plates, whether three-finger or diaphragm, are compatible with this adaptation. Ensure that the pressure plate is compatible with your engine, flywheel, bellhousing and actuation components. 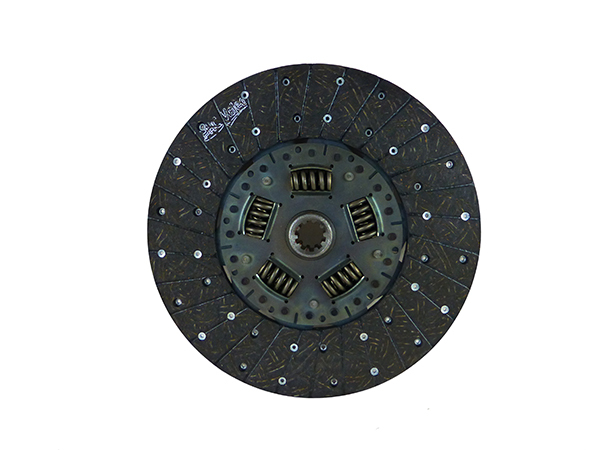 The proper clutch disc will be required and can be purchased separately below. 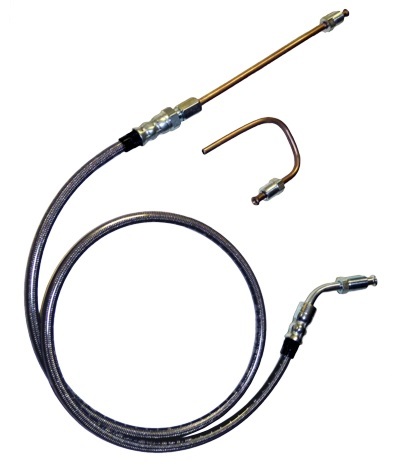 The factory clutch release arms and their linkages can be retained and adapted as necessary. Again, the above recommended Small Block Ford Bellhousing combination has proven to be the easiest to convert using our hydraulic clutch release systems when using the Windsor style Ford small blocks. All versions of the AX15 & NV3550 are compatible. 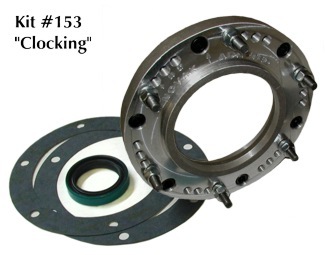 However, 1994 and later AX15's and all NV3550's will require a minor modification to their input bearing retainer. Earlier AX15's that featured the concentric internal throwout slave bearing do not require this modification. 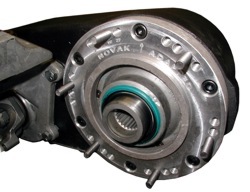 This is also compatible with Novak’s new upgraded, stronger AX15 transmissions which come assembled to the extent possible with parts ordered. They can be seen here and purchased below. 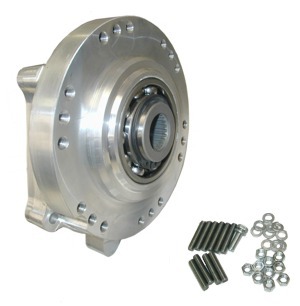 The AX15 and NV3550 feature a threaded base for support and isolation of the transmission and transfer case. 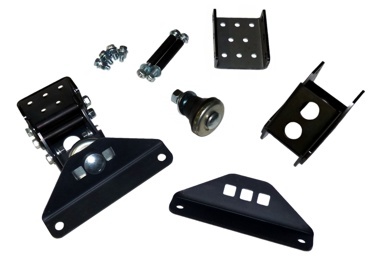 Factory style isolator mounts are difficult to work with in any situation other than as a direct factory replacement. 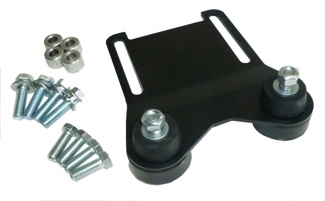 Novak has engineered a universal style rear mount that is easy to affix to a variety of Jeep crossmembers and is very strong and highly adjustable. We recommend it in any retrofit situation. More info on this mount can be seen here. 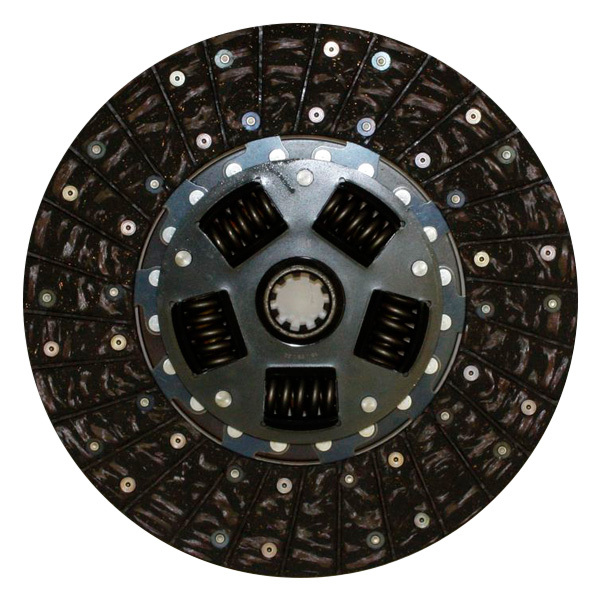 The typical Ford clutch disc uses a 10 spline 1-1/16” hub. This adapter requires a 10 spline 1-1/8” hub be used. 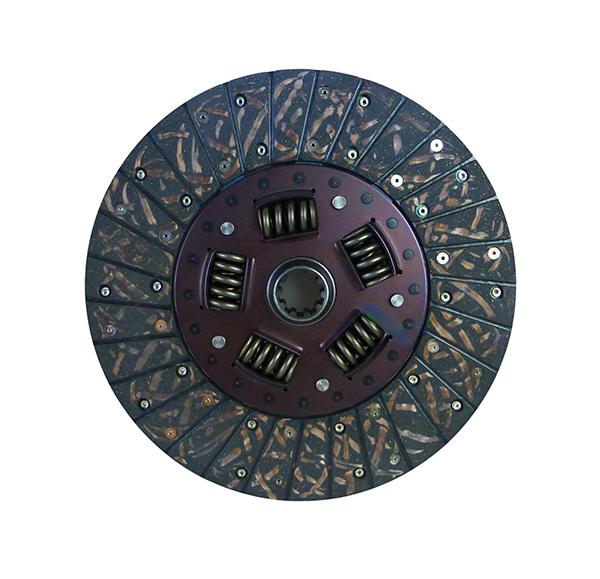 A matching diameter clutch disc will be required to use the transmission with your Ford engine. Below are the disc options to match your pressure plate diameter. Novak's #152 adapter kit. *Warning* Watch closely the overall length of the 152 combination. Because the transmission and transfer case shifters are often in a different location than factory in these Jeeps, this new transmission tunnel cover gives the installer a clean slate. There are no screw holes nor transmission & transfer case shifter holes, allowing the installer to drill and cut them as necessary. An easy way to get a perfect fit is to use the old cover as a template, making cuts as necessary, then overlay on the new aluminum piece for perfect holes. The finish is natural brushed aluminum, which looks pretty terrific, but it can easily be primed and painted to suit, if desired. Many of these transmission retrofits end up in earlier Jeeps and they often require a modified transfer case shifter kit. 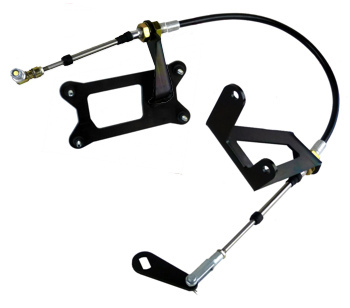 For the Jeep Dana 300, we recommend the Adjustable Length twin stick kit with these transmissions. The TX300 can be used but is positioned further back and requires modification to the shifters to clear as well as the pan and tub. Later Jeeps will likely want to look at our cable shifter line here. A drill, 29/64” bit, and various smaller bits are required, in addition to typical mechanic's hand tools. Note that NV3550 transmissions have a shift rail boss that protrudes through the adapter, and will require that the bellhousing be milled for clearance. 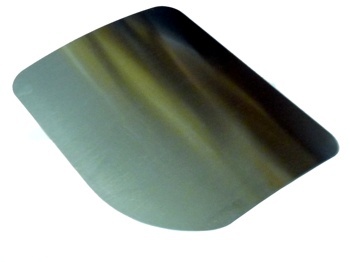 The adapter can be used as a template to mark for this operation. 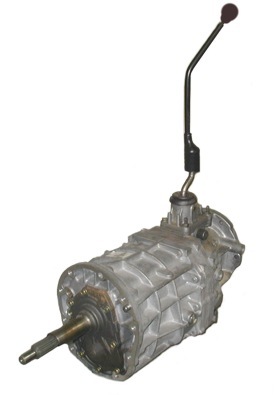 Transmission placement is largely determined by factory engine location. It is not necessary in typical conversions to change the engine position. Setting the powertrain to the proper factory or conversion pitch angle - usually tilted down ~5 degrees (3-7 acceptable) is recommended. If converting to a V8 in conjunction with this upgrade, aftermarket engine mounts are available to ease its installation. Novak's MMX Series engine mounts.